Something about fishing holds my little boy entranced and I think a magnetic fishing set would rock his world. The longest he will stand still, anytime, is when he is standing still by the water with his little stick with a string tied to the end of it, ‘fishing’. Ofcourse his hookless line never catches anything—unless it is a bit of algae or an underwater plant. If he catches one of these, though, he is thrilled and peremptorily christens it ‘fish’. Is fishing magical to your toddler too? Even if it isn’t to begin with, it is likely to become so when you buy him a magnetic fishing game. It’s a game in which fish can actually be caught, collected, and counted! And it isn’t just good fun; it can be an important fine motor control exercise and give your child an opportunity to practice counting and color recognition as well. That was when I began my ‘magnetic fishing’ research, looking for a quality set that my toddlers would enjoy playing with and that was sturdy enough to enjoy their rough play. I found there was a wide selection: from simple wooden puzzles that came with a fishing rod to slightly nicer wooden fish in wooden fish ponds. Yes, it’s just wooden puzzles, but as these two puzzles come in a set—with two magnetic catchers—you have enough pieces that you can have fun scattering them over a designated ‘pond’ and going fishing. One player catches fish, the other catches bugs. 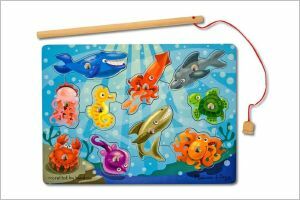 As an added exercise, have your child try using the rod to place the pieces in the correct puzzle after he has caught each fish or bug. In a two-person game, the first player with a filled puzzle is a winner. 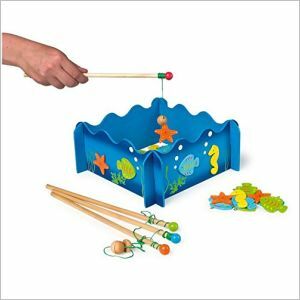 I love the simplicity of the fish in this quality wooden game set: as well as the wooden ‘fish bowl’. This set has four fishing rods, so as many little friends as happen to be over can play along. There is no puzzle element, but simply catching fish, counting them, and sorting them by color is very exciting to children in this age range. Since the fishing rods also have color designations, you can play a game in which only the red rod is allowed to catch red fish, only the blue rod is allowed to catch blue fish, and so on. It’s another way to cement the concepts of color differentiation and sorting.